As intended, the Brunswick dredge-spoil island has been a nesting hotspot for sea- and shorebirds since it was built in 2007. But the Spartan setting of sand, ground-hugging vegetation and rip-rap is no haven from hurricanes. Which is why DNR wildlife biologist Tim Keyes was surprised when he checked the island just off Jekyll Island this week and saw that about 35 brown pelican chicks only about 8 weeks old had survived Irma. “These guys would’ve just hunkered down” when the storm hit, Keyes said. The pelican colony on what some call Bird Island had an estimated 82 nesting pairs at its peak this summer. The parents of the chicks that weathered Irma had nested later than normal, possibly re-nesting after high tides flooded their previous nest sites, said Keyes, who works with the agency's Nongame Conservation Section. When Irma crossed into the state Sept. 11, it was veering west across central-southwest Georgia and had weakened to a tropical storm. But along the coast the storm still packed high winds – Jekyll recorded a gust of 77 mph, The Brunswick News reported – record storm surges and drenching rains. Keyes said it helped that the pelican chicks were not on the island’s lowest shelf, though they were only about 6 feet above sea level on land that is only 14 feet at its tallest point. While the approximately 10-acre island suffered significant erosion along the north and eastern shores, the nesting habitat remains intact, he said. Other seabird and shorebird nesting sites in Georgia didn’t fare as well. Keyes wrote in an email that Irma exacerbated the damage wrought by Hurricane Matthew last year: wiping out “what little was left” of Ogeechee Bar in the mouth of the Ogeechee River, erasing higher dune areas on Little Egg Island Bar in the Altamaha River and causing significant loss of dunes on the other islands he has checked so far. As for the young pelicans on Bird Island, the adults are caring for them and they will fledge in two to four weeks, an Irma footnote to the resilience of wildlife. For more on conserving shorebirds and seabirds in Georgia, check out Nongame Conservation Section’s annual report. The storm blew many seabirds inland. Sightings of pelagic species at Georgia lakes included magnificent frigatebird, black-capped petrel, brown noddy, Cory’s and greater shearwater, Sabine’s gull, white-tailed tropicbird, bridled and sooty terns, and the state’s first inland record (on West Point) of an American oystercatcher. Also see: “How do hurricanes affect birds?” at Audubon.org. 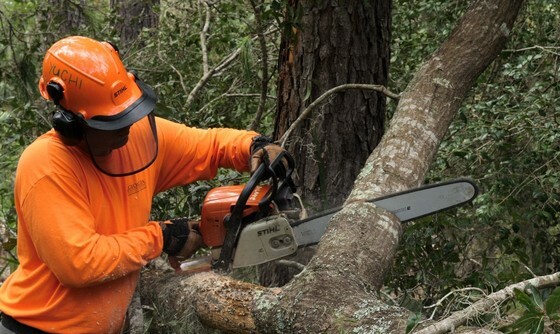 Clearing miles of roads, with Wildlife Resources Division debris removal teams and other staff logging more than 3,800 hours, or 475 man-days. Opening all state parks to shelter evacuees. Helping ensure the health, safety and welfare of communities, including providing security as evacuated areas were re-opened. Opening a call center for constituents regarding impacts to docks, marinas and other property in coastal waters, marshlands and along island beaches. As a seasonal field tech with DNR aquatic biologists, my work is seldom the same week to week. One week I might be in a creek in a south Georgia swamp, sifting sand through my fingers to find mussels. The next, I could be in a mountain stream in north Georgia, looking for endangered fish species. 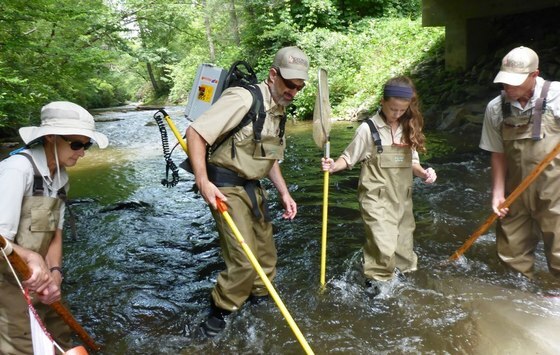 Last month, it was the latter as we surveyed streams in the Etowah and Coosawattee River basins for holiday and bridled darters. Both species are state-listed as endangered and petitioned for listing under the Endangered Species Act. 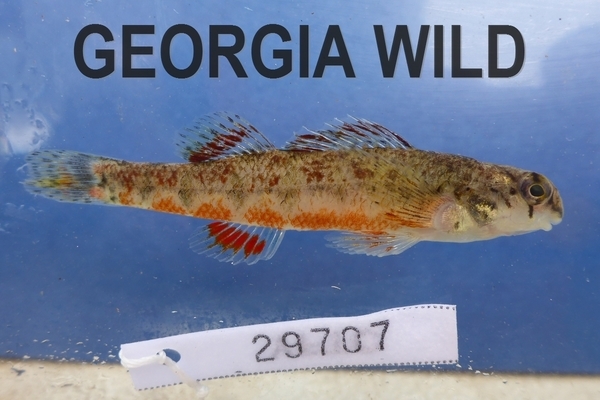 Explore images of our native fish species in the Fishes of Georgia Photo Gallery. What do you like or don’t like about Georgia Wild? Tell us in the annual newsletter survey. Taking part can even simplify your life. How so? Complete the survey, include your email – it’s one of the questions – and you will be entered in a drawing for a Weekend for Wildlife trunk organizer. 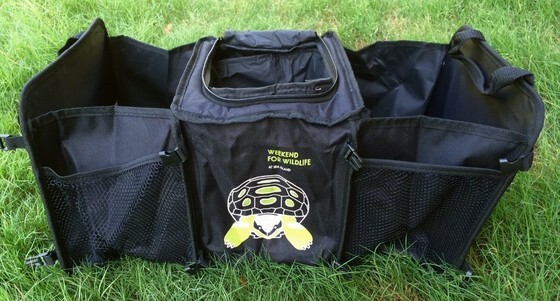 Each organizer has a cooler in the middle and a cool gopher tortoise logo on the front. Organize your car. Improve Georgia Wild, and thereby help conserve wildlife. It's a win-win-win. No other venomous snake native to Georgia can match cottonmouths when it comes to myth, mystique and downright confusion. 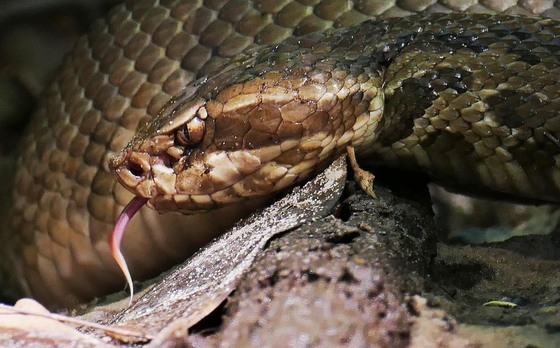 The fallout varies from mistaken views on the species’ purported grumpiness to Georgia's five nonvenomous watersnake species all being called – and killed as – water moccassins. To help sort fact from fiction, here’s an explanation of an on-the-water encounter videoed in Virginia, where a cottonmouth exhibits a common defensive behavior that is often wrongly perceived as aggression. Another helpful resource is DNR’s “Is it a water moccasin?” brochure. 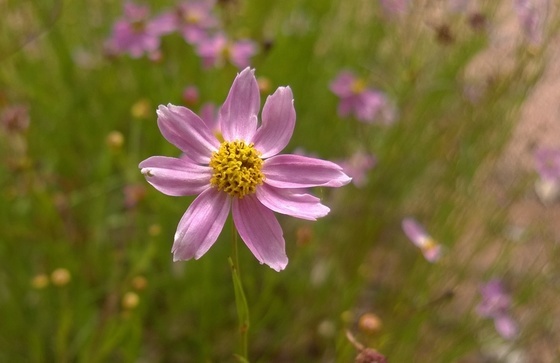 Newly hired as a rare plant survey and safeguarding technician, Nongame Conservation’s Sabrina Sewell discovered Georgia’s third known population of pink tickseed during a trip to Lake Hartwell. The globally vulnerable plant is more common along pond shores in the Northeast, and was likely distributed to Hartwell by waterfowl, DNR botanist Tom Patrick writes. DNR is again offering a $1,000 grant to a third-, fourth- or fifth-grade public or private school teacher in Georgia who demonstrates exceptional energy and innovation in teaching life sciences. Oct. 16 is the deadline to apply for the Conservation Teacher of the Year grant funded by The Environmental Resources Network, or TERN, friends group of the Nongame Conservation Section. More than 86 million Americans were involved in wildlife watching in 2016 and they spent an estimated $75.9 billion, according to preliminary findings in the latest U.S. Fish and Wildlife Service survey done every five years. Overall, the survey found that 40 percent of the U.S. population 16-and-older – 101.6 million people – fished, hunted or watched wildlife, ringing up $156.3 billion in expenditures, or $1 out of every $100 in goods and services produced in the nation. Compared to 2011, wildlife watching – people who had a special interest in wildlife around their home or a took trip primarily for wildlife watching – increased 20 percent in participation and 28 percent in expenditures. State-specific reports will be released later. Ever heard a bat? Here’s a sample of bat calls recorded during North American Bat Monitoring sampling by DNR’s Emily Ferrall and Maggie Hunt at Cumberland Island National Seashore this summer. Bats echolocate at pitches humans cannot hear, but the Anabat device used here records the calls and lowers the frequency, providing call data scientists can use to identify species. 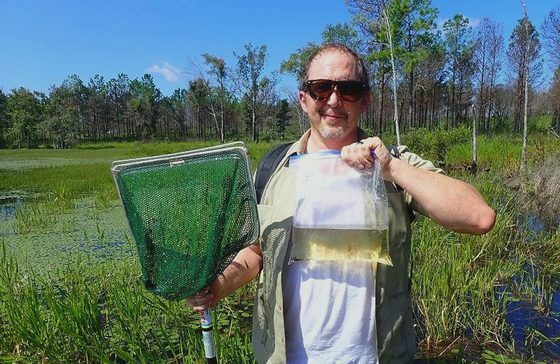 Twenty-five striped newt larvae were collected at Sandhills Wildlife Management Area to boost captive collections where the imperiled species are being reared for reintroduction efforts, including in Apalachicola National Forest. Of the newts netted by Nongame Conservation senior wildlife biologist John Jensen and partners, 12 went to Amphibian Foundation and 13 to the Detroit Zoo. DNR’s “Exploring Georgia’s wildlife” coloring book, a teaching aid for conservation that also explains the role wildlife license plates play, has been shared by the state Education Department with all third-grade teachers in Georgia. The book created by Nongame Conservation Environmental Outreach Coordinator Linda May and artist Ami Flowers Staples was funded TERN. A partner-powered project to restore Raccoon Creek in Paulding County has been recognized as one of the Georgia Water Coalition’s Clean 13 for 2017. The organization's report highlights what it calls “extraordinary efforts” by individuals, businesses, nonprofits and governments that have led to cleaner water. Names in the news: Following a promotion, DNR wildlife biologist Jason Wisniewski, longtime leader of mollusk conservation for the agency, will now also lead the Nongame Conservation Section’s aquatics team and projects. Botanist Dr. Mincy Moffett Jr. recently taught a botanical/ecological field seminar at Ohoopee Dunes Wildlife Management Area for a senior-level field biology class from Middle Georgia State University. Sept. 27 – Annual fall meeting of Georgia Sea Turtle Cooperative members, 8:30 a.m.-noon, DNR Coastal Resources, Brunswick. Details. Sept. 30 -- Your State Parks Day, sponsored by Friends of Georgia State Parks & Historic Sites. Features volunteer events benefiting parks, including storm clean-up and removing invasive plants. Oct. 13-15 -- Gopher Tortoise Council annual meeting, National Wild Turkey Federation, Edgefield, S.C.
Oct. 14 -- Rivers Alive event removing Chinese privet at Mill Creek Nature Center, 9 a.m. Includes wildlife presentation by DNR's Linda May. Details. Oct. 21 -- Reptiles Alive! 2017, Westin Savannah Harbor Golf Resort and Spa. Sponsored by resort and Friends of the Savannah Coastal Wildlife Refuges. Nov. 3-5 – Becoming an Outdoors-Woman workshop, Charlie Elliott Wildlife Center, Mansfield. Scholarships are available (apply by Oct. 16). "Saving Georgia’s state reptile," Saporta Report. Also: Georgia Trend. Why is this eastern box turtle blue? The turtle, seen in Cherokee County, is not painted – which would be illegal – or infected. Instead, the blue tint is a genetic pigment anomaly, writes Dr. Jessica McGuire, manager of the DNR Wildlife Resources Division’s Private Lands Program. 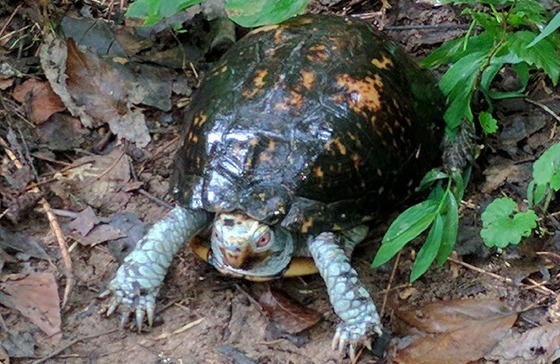 Because of the unique look, box turtles with this condition are highly prized in the pet trade, McGuire said. Possessing or selling a box turtle is illegal in Georgia. 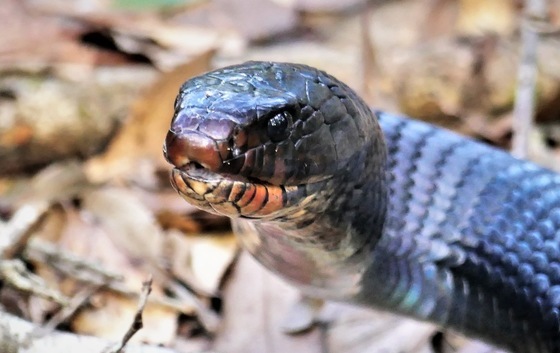 This eastern indigo snake was spotted recently in a dry, south Georgia swamp floodplain. Already rare, indigos are scarcely seen in spring through early fall as they range far from winter retreats in upland sandhill habitats. The species is non-venomous, federally protected as threatened and can grow longer than 8 feet. The male shown here, reported by Matt Moore and Dirk J. Stevenson, was about 6.5 feet. Indigos are highly resistant to the venom of pit vipers, including rattlesnakes, copperheads and cottonmouths, and will eat venomous and non-venomous snakes.